Do you hate to be corrected? Re: Do you hate to be corrected? I know I SHOULD just hide/unfriend everyone who posts stupid crap, but I have a compulsion to try and make people see the truth. Everyone's entitled to their own opinions, but they aren't entitled to their own facts. I'm all about being open to new ideas and perspectives, but only when it's a two-way street. I hate people who think you should be open to their view, but they're not open to yours. I agree - I have some friends that I disagree with politically but I can have a rational discussion with them, no problem. It's the ones who say their bit and then jam their fingers in their ears I can't take. 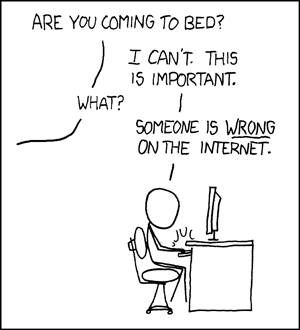 No one likes to be wrong and no one likes to have it publicly pointed out. I used to respond to family members directly with no CC's on stupid, blatantly incorrect info they would send out and gently inform them of what was incorrect and where they could check such things. It seemed to work for awhile, or so it seemed, until I found out that they just removed me from their mailing lists. I don't necessarily miss knowing about the next family reunion but it seemed extreme to need to make my younger brother promise to notify if Mom dies. I really would like to go to the funeral (and not to defend my position in the estate ). Now I've decided that I will just delete/ignore info that I disagree with (assuming I'm ever added back to the mail lists). And I have no use for Facebook, Twitter or any sites that expose person information to the world, even when setup your security "correctly", and just waste time. I actually like being able to keep up with what's happening with some of my relatives on FB. definitely have to unsub from certain people though. I think facebook is for retards. As someone that donates time to work with challenged people I find this pretty offensive. If you don't like FB, fine, but your choice of expression is just plain wrong. "Retarded" just doesn't have the impact it once did I'm afraid. If I meant "developmentally challenged" I would have said so. I've replied to my family with so many links from snopes that they don't even bother sending me that kind of thing any more. And yeah, on facebook I just hide or unfriend people who post stupid or annoying stuff. It works fine. Same here. But being a 20 something woman, I have to also hide all the ridiculous amount of babies that show up in the thread. SO MANY BABIES. I've gotten it down to mostly my homebrew club, beer related things and my fun (and not stupid) friends. I'm never wrong I can't believe no one said that yet. At least you have the cojones go correct me! I know what you mean! I have kids and I get that they are a big part of a parent's life, but I don't need daily updates on what they are doing.